Politifact Ohio is a project of the Cleveland Plain Dealer. Sherrod Brown is married to Connie Schultz, who used to be the paper’s star columnist. (Until we caught her doing political work, that is.) So, any editorial work from the PD involving Brown was already slightly suspect. But what Jason Hart from Media Trackers Ohio has discovered about Politifact Ohio is truly troubling. In public posts to Twitter, PolitiFact Ohio fact checker and registered Democrat Tom Feran has expressed enthusiastic support for President Obama. “Yes we did,” Feran tweeted on November 5, 2008. “I like the idea of Bush leaving early. It’s time to get the spectators off the field,” Feran tweeted later that month. In work for PolitiFact Ohio, Obama voter Tom Feran has thrown cold water on criticism of Obama’s 2010 health care law both before and after the June 28 Supreme Court decision. Feran, who routinely writes about conservative political figures for PolitiFact Ohio, has described conservatives as “yahoos” and “wingnuts” on his personal Twitter account. Just like Sherrod Brown, Tom Feran is also in love with the Occupy movement. Feran has taken to Twitter with his complaints about “income inequality” – the primary complaint of socialist movement Occupy Wall Street – time and again, even expressing support for Occupy Austin in October 2011. Tom Feran is clearly as left-wing as Sherrod Brown is, and has gleefully published articles singling out Josh Mandel to help Sherrod Brown stay in the Senate. What’s more, Hart also reports that there are four times as many Democrats as Republicans on the Politifact Ohio staff. 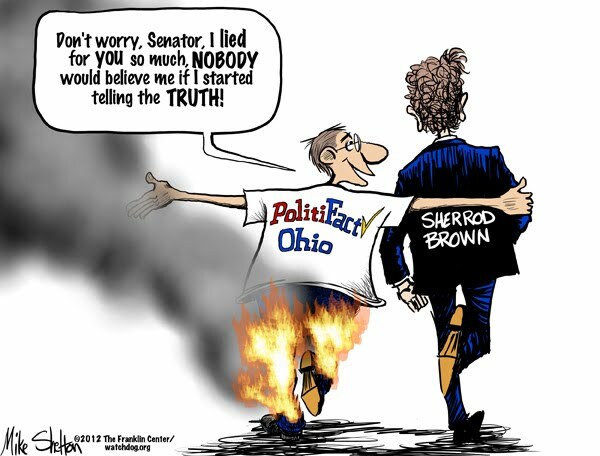 Tom Feran and the gang would have you believe that Josh Mandel tells six times as many lies as Sherrod Brown. Unless you’re a 100% partisan, no one really believes that. What the Plain Dealer has done here, is to analyze and cherry pick every word that Mandel says, but let Sherrod Brown’s lies just go unreported. For example, Sherrod Brown once said that extending employment benefits creates jobs. Not a peep about this from Politifact Ohio. But they gave Mandel a “Pants on Fire” for talking about what a huge tax increase Obamacare is. Sherrod also said that “Everybody knows that government creates jobs”. Did Politifact Ohio challenge his assertion that everybody believes this? Or talk to any economists who believe that government can actually create job growth? People generally expect a bit of liberal bias from big city newspapers. But the hack job that the Plain Dealer has perpetrated on Josh Mandel is beyond the normal expectation. This is gross example of pure biased reporting. Thanks to the work of Tom Feran in particular, calling any part of what Politifact Ohio does “journalism” is a sad and unfortunate joke.